Phil: Sony also mentioned that this is the first camera to feature 'Clear RAW NR' which hints that noise reduction is carried out on the RAW data before it is converted to JPEG. 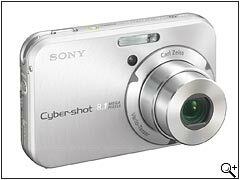 SAN DIEGO, Oct. 3, 2005 —Sony adds more enjoyment and value to your digital photography with its new full-featured compact digital camera with built-in photo sharing functions that goes beyond just picture taking. About the size of a deck of playing cards, the stylish Cyber-shot® DSC-N1 is a high-performance, 8-megapixel camera, with an amazingly large, 3-inch, touch-screen LCD that is rare for a compact camera of this size. The N1 features a new album function that automatically stores up to 500 of your favorite images in VGA resolution, and uses them to create dynamic slide shows with music and transition effects – in the camera. Take pictures with the confidence that you’ll get excellent picture quality. 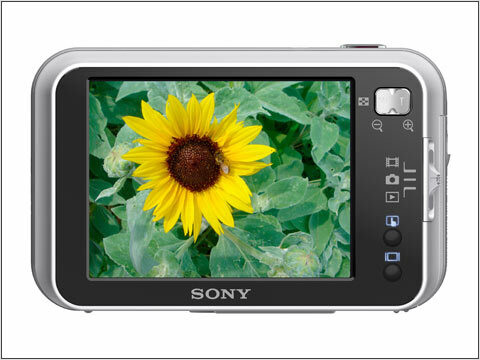 With the DSC-N1’s 8-megapixel Super HAD™ CCD, its resolution is extraordinary for a compact camera. The camera’s Carl Zeiss Vario Tessar® lens lets you capture images with the utmost sharpness and clarity. Sony’s Real Imaging Processor® LSI provides excellent color accuracy and incredibly fast response times. Its advanced power management system delivers long battery life; up to 270 shots per charge (actual battery life depends on usage conditions). 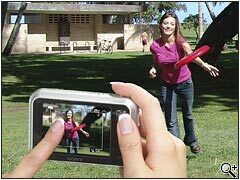 With shutter lag minimized to just 9 milliseconds, you won’t miss life’s most important moments. Moreover, the N1 offers excellent ISO sensitivity, which is of particular importance when shooting in low-light conditions. You can capture faster action at night with less blur or, in certain conditions, avoid using a flash altogether. With an optional Memory Stick PRO Duo™ media card, shooting high-quality video is a breeze. MPEG-VX fine mode allows you to record MPEG video with 640x480 pixel resolution at 30 frames per second, up to the capacity of a compatible media card. Now showing pictures to your friends and family is even more enjoyable. The Cyber-shot N1’s 3.0-inch LCD screen is almost the size of an actual photograph – large enough for easy viewing. The camera’s menu functions are accessible with your finger or thumb, and its innovative touch-screen interface reduces the need for traditional keys next to the LCD, allowing for a large screen in a very compact body. With Sony’s Clear Photo® LCD technology, your images will be bright, with high-contrast, and easy to view in virtually any environment. The N1’s album function automatically stores up to 500 of your favorite images for a “pocket full of memories.” By recording each image separately, once in full-resolution and again in 640x480-resolution, your favorite images accumulate for easy recall and sharing wherever you go. When you release the shutter, the full-resolution image is saved to an optional Memory Stick Duo™ media card or in the camera’s 26MB of internal memory. Automatically, the image is resized to 640x480 and stored in the portion of the camera’s internal memory dedicated to the album. Because you will take hundreds or perhaps thousands of pictures with your N1, the album function lets you protect the images you want to keep, so that over time you will have a collection of your favorite photos with you wherever you go. And with the camera’s file management system, you can quickly locate your images; simply search for pictures by the month and date that you originally created them. To expand your playback options, you can view your photos on your television, through the optional Cyber-shot Station™ cradle, or on your PC. You decide how to share your photos, Sony lets you do it. For even greater personalization of your photos, the DSC-N1 model also has a distinctive paint function that let’s you draw symbols or words on the pictures in your album using your finger or the supplied stylus. 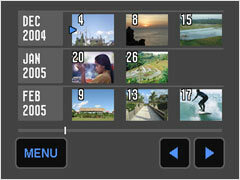 Now you can bring your photos to life with this latest model’s slide show function. 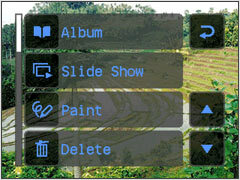 The N1 creates slide shows directly on the camera without using a PC. Images can be played back with such advanced features as transitions, pans, wipes, fades and zooms, choreographed to pre-loaded soundtracks. 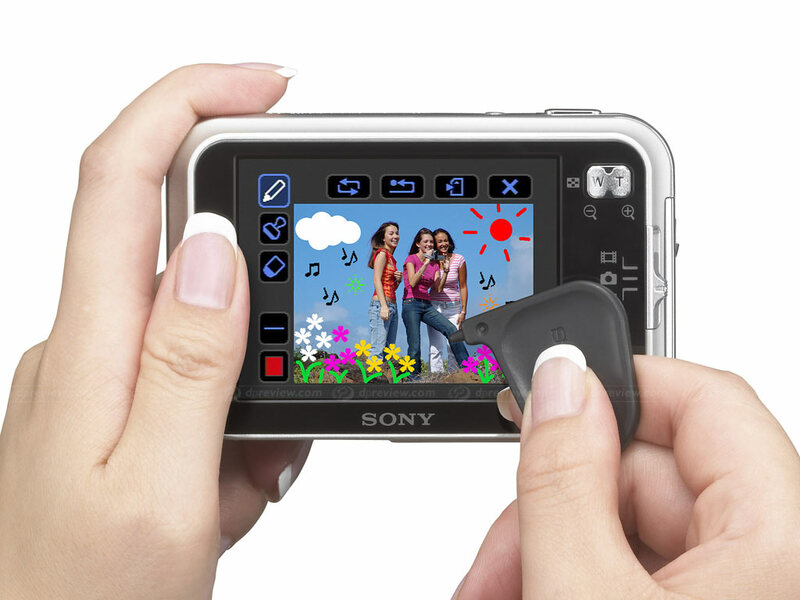 You can also use your own music, using the camera’s supplied software. With the camera’s built-in speaker, your slide shows are sure to have that cinematic effect with sound to complete the experience. Sony has even more ideas for enjoying your camera’s pictures and sharing them with family and friends. Connect the N1 model to a Sony DPP-FP50 digital photo printer and make prints at home or turn them into postcards or even calendars. If you need to print tens or even hundreds of pictures, or want to share funny video clips, Sony’s online photo service can make the job simple. At www.imagestation.com, you can create your own online photo and video albums, order prints, or make customized gifts from coffee mugs and photo books to calendars and T-shirts. The camera comes supplied with a Lithium Ion battery, battery charger, multi-connector cable, wrist strap, stylus, and software CD-ROM. Optional accessories include the Cyber-shot Station™ cradle, a marine pack, and leather carrying case. The Cyber-shot N1 digital camera will be available in mid-November for about $500 online at SonyStyle.com, at Sony Style retail stores (www.sonystyle.com/retail), and at authorized dealers nationwide. Pre-orders begin online today at www.sony.com/n1. Not only was 2005's Sony Cyber-shot DSC-N1 a respectable ultra-compact camera – it also had a 500-shot photo album and large 3" touch LCD for easy photo sharing (and painting).